« Have a cold? Try Soto Ayam! Happy Halloween! We are now sharing an apartment with the gigantic bag of candy procured by our little Princess Leia and furry beast last night, doling it out little by little and taking our cut along the way. This was the first year we took the girls to a proper trick-or-treating neighborhood in the suburbs and the spoils were tremendous. While I swear by city living, I do love a suburban Halloween. We started the festivities on Friday night with a pumpkin carving party and viewing of “It’s the Great Pumpkin, Charlie Brown!”, while roasting the seeds. My friend, Cindy, had shared her seeds with me earlier that day which she had seasoned with garlic salt. Delicious. I also tried a batched flavored with curry powder, which was a nice variation. Remove seeds from pumpkin, wash off the guts. Place seeds on a foil lined baking sheet and sprinke with olive oil and salt (or garlic salt, or curry powder). Bake at 375° for 25-30 minutes. In celebration of Mexico’s Day of the Dead, this bread is often shaped into skulls or round loaves with strips of dough rolled out and attached to resemble bones. In a saucepan over medium flame, heat the butter, milk and water until very warm but not boiling. Meanwhile, measure out 1-1/2 cups flour and set the rest aside. In a large mixing bowl, combine the 1-1/2 cups flour, yeast, salt, anise seed and sugar. Beat in the warm liquid until well combined. Add the eggs and beat in another 1 cup of flour. Continue adding more flour until dough is soft but not sticky. Knead on lightly floured board for ten minutes until smooth and elastic. Lightly grease a bowl and place dough in it, cover with plastic wrap and let rise in warm place until doubled in bulk, about 1-1/2 hours. Punch the dough down and shape into loaves resembling skulls, skeletons or round loaves with “bones” placed ornamentaly around the top. Let these loaves rise for 1 hour. Bake in a preheated 350 F degree oven for 40 minutes. Remove from oven and paint on glaze. Bring to a boil for 2 minutes, then apply to bread with a pastry brush. If desired, sprinkle on colored sugar while glaze is still damp. 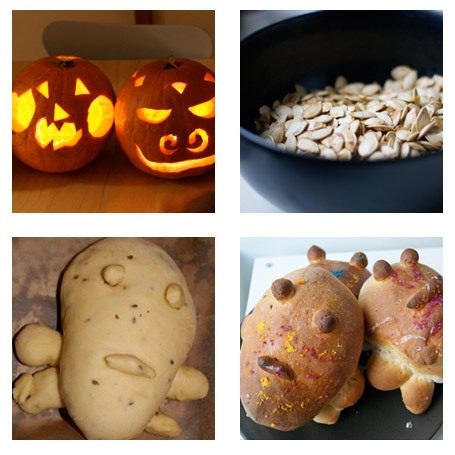 Day of the Dead lasts through November 2nd, so there is still time to make your funny skeleton bread. 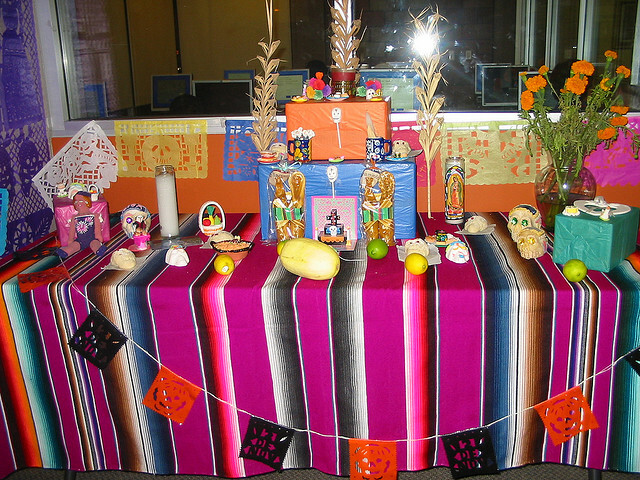 If you are interested in setting up your own Ofrenda, check out this post from Apartment Therapy. Enjoy! This entry was posted on November 1, 2010, 10:11 pm and is filed under kitchen. You can follow any responses to this entry through RSS 2.0. You can leave a response, or trackback from your own site.